Meghan Markle says her father will not attend her wedding to Prince Harry on Saturday. In a statement, she said she had "always cared" for her father and hoped he could be given the space he needed to focus on his health. 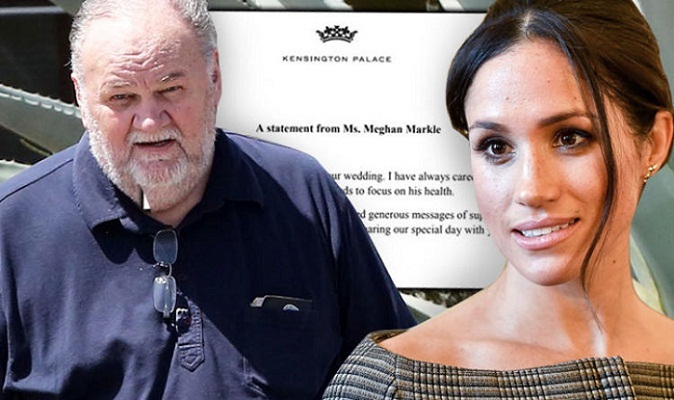 In recent days, doubts had been raised over whether Thomas Markle would be at the wedding to walk his daughter down the aisle. On Wednesday, it was reported that he had to undergo heart surgery. Markle had been due to meet the prince for the first time this week, as well as the Queen and the Duke of Edinburgh. The couple can expect a sunny and breezy day, with temperatures reaching up to a balmy 21C in the late afternoon. Markle, who is understood to be in Mexico, was caught up in controversy after allegedly staging photographs with the paparazzi. He later told US celebrity news website TMZ he would not attend the wedding amid the controversy; then that he would; and then that he could not, due to a planned heart procedure. Markle's estranged half-sister, Samantha, said he had faced "unbelievable stress". The paparazzi pictures showed Markle - apparently unaware he was being photographed - carrying out preparations for the wedding, including being measured for a suit. On Monday, Markle reportedly told TMZ that he would not attend the ceremony to avoid embarrassing his daughter. TMZ later reported that Markle wanted to be there - although it might not be possible because of health concerns. And in a third report, the website said that health issues and planned surgery would prevent him from attending after all. His absence leaves a big question mark over who will walk Markle down the aisle. Her mother, Doria Ragland, who arrived in the UK on Wednesday, would be one option, as would Prince Charles, Harry's father, or she could choose to walk alone. Markle has 10 bridesmaids and pageboys, all under the age of eight. She decided against having a maid of honour because she wanted to avoid choosing between her closest friends. The news came two days before the couple's big day, as a rehearsal of the carriage procession through Windsor took place. Hundreds of people lined the streets in the sunshine to get an idea of what's to come when the newlyweds take a 25-minute carriage ride through the town. The world's media, royal superfans and locals watched the military parade through the streets. About 250 members of the armed forces are expected to take part on Saturday. At the dry run, there was a heavy police presence, including armed officers and officers stationed on roofs to oversee the crowds. Markle formerly worked as a lighting director on programmes including the 1980s TV show Married with Children and General Hospital, for which he and his team won two Emmy awards. He and Doria Ragland divorced when Markle was six years old. Markle, who has two children from his first marriage - Samantha and Thomas - filed for bankruptcy two years ago. Markle has previously said: "It's safe to say I have always been a daddy's girl - he taught me how to fish, to appreciate Busby Berkeley films, write thank you notes, and spend my weekends in Little Tokyo eating chicken teriyaki with vegetable tempura."